I unloaded the groceries when we reached home and place them at the respective places. Just as I thought: my violin case and the pass holder is in there too. Frozen food are still cold, and the eggs are in the same condition as when I took them off the shelf. In fact, everything I put in there remains in the same condition as when I put them in. Quite amazing considering that where it was stored (inside my cloned body) was brutally stabbed earlier. Mamiko Hisakawa (16), second year high school of [name of my school] Academy, was brutally stabbed and badly injured at several meters away from [station of place I went to earlier]. Many witnesses say that they saw the recently escaped prisoners specifically attacking her with a knife from behind before escaping. We received several images from witnesses who were there. We caution on the nature of these images. This is a raw, unedited video footage we received [pause] and the picture that happened afterwards. [pause] Her twin sister, Saeko Hisakawa, was seen picking her up later on. We believe that chances of her surviving are slim as they stabbed deep into the body several times. If she does survive, it would take her several months to recover. Police are currently investigating at the site of the incident. It may sound like it, but they didn't say anything about me being in hospital at all, and they still refer my cloned self as Mamiko. 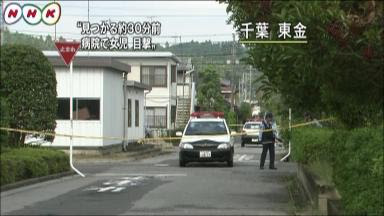 The footage shown during the report was police standing around the site with some investigating the blood on the ground. The picture that was sent in by some witnesses is indeed me and visually matched what I felt at that moment though quite gore to see myself like that. The video doesn't appear to be clear as the TV's HD broadcast, but it does seem to be a shaky footage from before I was attacked until Tanigawa-kun started to cry in my hand. I wonder who saw this report, because those reporters made this such a big deal. 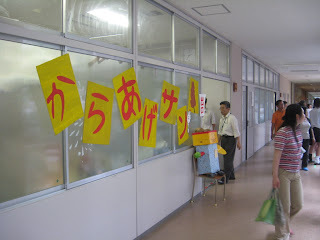 The summer holidays had now ended. Due to the upcoming festival, lessons were postponed to a latter date, so everyone would be helping on the planning and some decoration. The school and companies they assign does the rest due to the massive scale. However, the homeroom period remains and could be longer than usual as we come up on what to do. I wouldn't be involved with the class during the event as I'm with the music club. Before today, after that news report, I would try to avoid leaving the house as there could be reporters and busybodies waiting outside. Today however, we had no choice. We decided to keep distance where we can't see each other until we reached the classroom as to make people think that "my twin" is still in critical condition if they were to see one of us. I had to explain to my music club members that it was her and not me who attended the first practice as the facts mentioned in the report don't add up. Other people asked me several questions, some of which I can't answer. Examples include what hospital she was sent to, why they were after me, and other stuff. 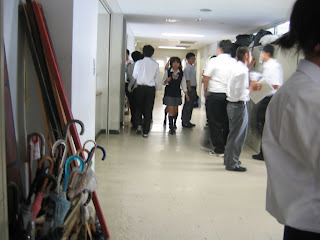 In fact, I noticed an unusually large number of people at the building wing and the corridor leading to my classroom. It's giving me a headache, though I saw this kind of thing coming. As one of me enters the classroom first, someone had placed a small vase containing a flower where Mamiko sits, which usually means that the person who sat there has passed on or is away for a long time due to health reasons. It seems that everyone was waiting for me and tried to make me feel better after they saw the news report. Aiko, one of my best friends (Haruna is the other) and daughter of the director I work for, seem to see right through me, but did not interrupt the crowd that were surrounding me. I purposely had the other me to come in just after the bell rang to surprise them. They are sitting back at their seats, waiting for the teacher to enter. The me outside then opens the door, but still out of sight to the people sitting at the front row. The classroom became dead silent. I entered the room, smiling. Everyone was surprised and speechless. They looked between me and the me who entered earlier and can't believe what they saw. They asked what was going on as they showed the picture of a lifeless me in a pool of blood and another of the recorded report on their mobile phones. I get sick each time I see that picture, even more if that body in the picture is me. I wanted to say that Mamiko is invincible, but that could attract unnecessary, and possibly bad, attention that, in the end, I made the me who just entered (Was it my clone or original body? I can't tell as my mind is in both.) that I am clueless myself. As the day of the festival approaches, I can see that the entire campus is decorated with banners, stalls, signs, and other stuff. I haven't visited that school since that day, and the news of me being brutally stabbed at a public place in front of many people and then appearing perfectly fine the following day don't seem to spread outside the high school section. Everyone seems to rely on me more lately from helping people with decorating, ordering of food & drinks, solving problems and even sewing costumes. Hey, why am I the one doing most of the work? Just because I know how to do things better than the rest of my peers does not mean I should do everything! One of me was preparing some administrative work with my juniors who are kind enough to help when I suddenly collapsed on the table. Huh? What is this strong headache I'm having? Why is everything feeling colder even though the temperature is unchanged? And why am I having difficulty in moving about? I don't know what happened, but I suddenly collapsed, though conscious enough to move my cloned self as normal as the energy to move it are separate. The other me appeared shortly with a familiar-looking wheelchair and checked my original body. Other people were there comforting her, but clueless on what to do.